For the Tuesday December 1st edition of CMNYK, we welcome back Manhattan on the Rocks, who will be playing live jazz music in the theater as they did for the one year anniversary screening on July 7th. This time around we have a somewhat more ambitious screening planned, as instead of accompanying a short before the feature, Manhattan on the Rocks will be playing along with the feature itself, Orson Welles’ once thought to be lost silent film, Too Much Johnson (1938). Based on an unfinished concept by Welles, which was way ahead of its time, the film was meant to be part of a multimedia production of the play Too Much Johnson, by William Gillette, that Welles and his Mercury Theatre Troupe were staging. Welles envisioned a brilliant but ultimately unrealizable concept of a stage play with big budget comedic action sequences projected live in between swathes of dialogue. Filmed in 1938, Johnson is the wild tale of a love triangle that spins out of control with hilarious and classically cinematic consequences. Starring the legendary Joseph Cotten, the film is beautiful and simultaneously inscrutable due to the missing sequences of the play which were never filmed, being meant to be performed on stage. The project was scrapped by Welles as a failure and a learning experience, but it leaves us with an important bit of film history to enjoy. 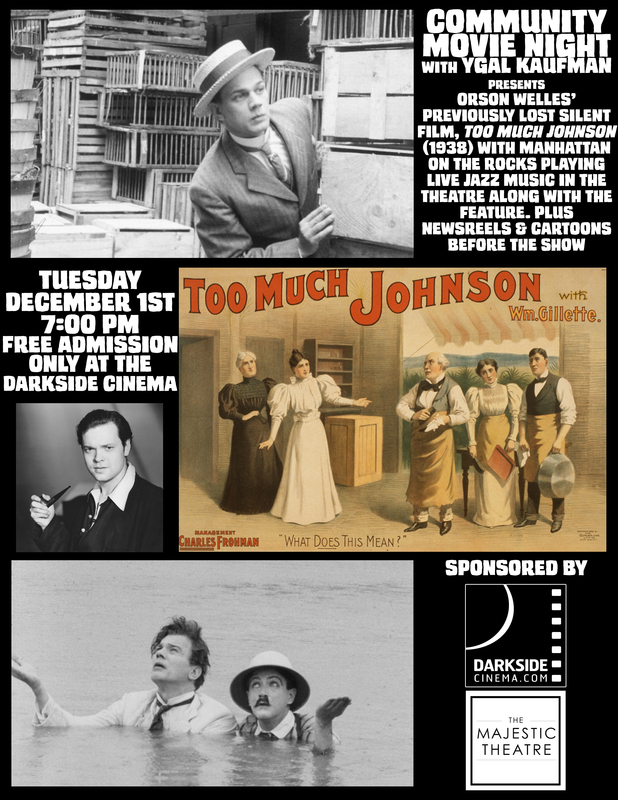 On Tuesday, December 1, at 7:00 PM at the Darkside Cinema, CMNYK will screen the 67 minute Too Much Johnson, with live music provided by local jazz band, Manhattan on the Rocks. The screening will be preceded by newsreels, shorts and cartoons from 1938, as well as an introduction from Ygal Kaufman, who will shed some light on the plot of the play to aide in your enjoyment of the film. Admission is free as usual, but donations are accepted and benefit the Darkside Cinema renovations and Manhattan on the Rocks. Better get there early, this one could fill up fast. Don’t forget to stop by our sponsor, The Majestic Theatre, for all their great programming. Starring Danny Kaye, directed by Henry Koster. Clown prince of Hollywood, Danny Kaye, stars in this wonderful and warm hearted comic musical about a case of mistaken identity. Kaye plays Georgi, a common con man who is mistaken for the Inspector General, and whose life may consequently be in serious danger, with hilarious results! Laughter, sight gags galore and amazing musical numbers highlight this classic family friendly film based on the classic play by Nikolai Gogol. This CMNYK screening is going down at the Darkside Cinema on Tuesday, November 24th, and the fun starts at 7:00 PM. As always, admission is FREE, but donations are welcomed and benefit the Darkside Cinema renovations. The show will be preceded by an intro from Trader Joe’s frozen chicken potstickers lover, Ygal Kaufman, as well as newsreels, shorts, cartoons and other weird goodies from 1949 to make the experience extra authentic. See you all there! Starring Joan Crawford and Walter Huston, directed by Lewis Milestone. This stirring pre-code drama is one of legendary Joan Crawford’s most overlooked performances. She plays Sadie Thompson, a prostitute on the island of Pago Pago who gets mixed up with a missionary, religion and feminism with beautiful results. This is the third CMNYK screening based on the work of Somerset Maugham, the second featuring the great Leiws Milestone in the director‘s chair, and the first featuring one of the greatest stars in Hollywood’s history, the great Joan Crawford. The role of Sadie was also famously tackled in a silent version in 1928 starring Gloria Swanson, and a watered down 1953 version with Rita Hayworth, but Joan Crawford’s is the most unique and daring take. 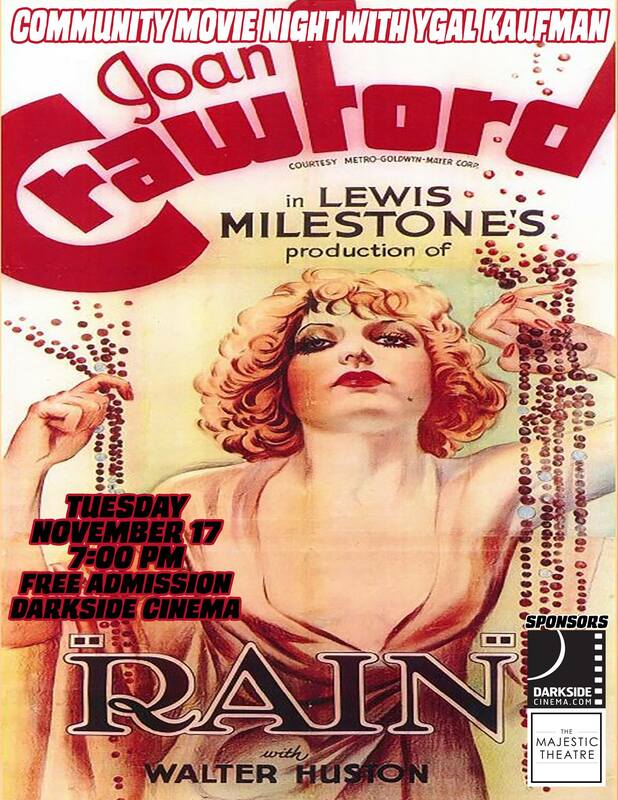 This CMNYK screening is going down at the Darkside Cinema on Tuesday, November 17th, and the fun starts at 7:00 PM. As always, admission is FREE, but donations are welcomed and benefit the Darkside Cinema renovations. The show will be preceded by an intro from long celebrating Cleveland Cavaliers fan, Ygal Kaufman, as well as newsreels, shorts, cartoons and other weird goodies from 1932 to make the experience extra authentic. See you all there! Don’t forget to like us on Facebook for reminders and notifications about contests and special events! And make sure to stop by our sponsor, The Majestic Theatre, for all their great programming.